The Congress of Neurological Surgeons (CNS) is an organization with a strong reputation of innovation, both in medical advancements and education. With more than 8,000 members around the world, CNS has a proven history of inspiring its members to continuously learn and discover and apply their knowledge into clinical practice. Innovation. Education. Inspiration. Discovery. Those are words that are very familiar to the team here at eRounds. We take them to heart every single day. And it’s why we’re very excited to announce that CNS – an organization with which we share a number of values – is our first partner in creating a professional community within eRounds. Known as mCase Exchange, the new community will be unveiled to CNS members at its upcoming CNS Annual Meeting in New Orleans later this month. The community will be available only to CNS members, offering them the opportunity to share cases with a verified community of their peers. As is the case throughout the eRounds platform, mCase Exchange is fully moderated and offers native tools to quickly remove any personal health information (PHI). CNS president Nathan R. Selden, M.D., Ph.D, has had the opportunity to test the new mCase Exchange community and is excited to introduce the platform to his CNS colleagues. Matthew McGirt, M.D., a neurosurgeon at Carolina Neurosurgery & Spine Associates in Charlotte and member of the CNS executive committee, said the opportunity to collaborate in a practice-based learning environment is a key aspect of the platform. 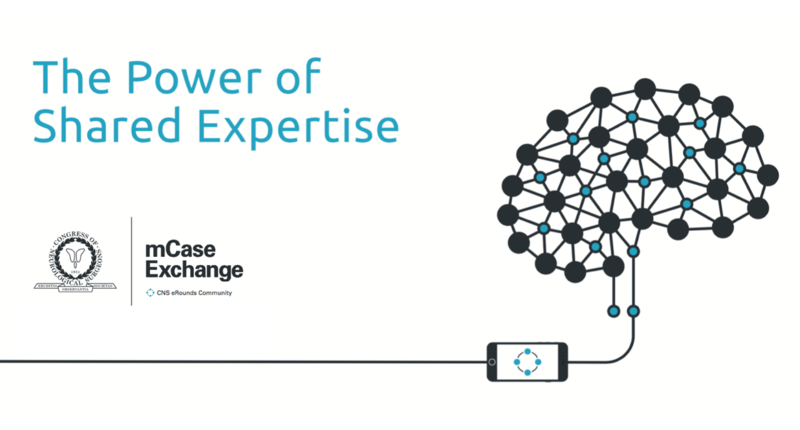 We’re excited because mCase Exchange will allow CNS members to have more than 140,000 collective years of neurological experience at their fingertips at any given moment. The theme of this year’s CNS Annual Meeting is “Mentorship – Service, Education, Progress.” We couldn’t think of a better theme to rollout this platform, which will continue to allow CNS to innovate, educate, inspire and discover. We’ll see you in New Orleans.